Apple has just released an update to their popular media player program iTunes. The update, numbered at 10.5.1 Beta 2 for developers, brings support for iTunes Match on Apple TV (10.5.1 Beta 1 brought it for iOS devices) which scans your music library and can match tracks with tracks in the iTunes Store. iTunes Match was first announced alongside iOS 5 and iCloud at this year’s WWDC event in June. It is a part of Apple’s cloud storage/computing service and it matches songs in your library with the one is the iTunes Store online. Songs which match are automatically added to your iCloud library so you can access them from any of your iOS devices based on iOS 5 and Macs on OS X Lion. Today’s update to iTunes – iTunes 10.5.1 Beta 2 – brings support for iTunes Match for all iOS devices, including 2nd-gen Apple TV. iTunes Match stores your music library in iCloud and allows you to enjoy your collection from anywhere, any time, on your iPhone, iPad, iPod touch, computer and now your Apple TV. The basic advantage that iTunes Match offers is that you don’t have to upload matched songs; instead, you get to listen to high quality 256kbps AAC DRM-free tracks which are streamed/stored on supported devices. As there are over 20 million songs in the iTunes Store, most of your songs will be matched and the rest will have to uploaded by you. iCloud’s iTunes In The Cloud suite of backup and syncing services, now with iTunes Match, makes it the best backup/sync service in the market today. No other cloud storage service is as complete as iTunes in the Cloud is from today. New purchases automatically appears on all your devices, previous purchases can be downloaded any time, all your songs (matched ones, at least) can be streamed and stored at a high-quality bitrate, anytime from any support device. iTunes Match, unfortunately, isn’t free. In order to avail it, you will have to pay $24.99 per year so your songs can matched and then streamed/stored. You can currently download iTunes 10.5.1 Beta 2 for Windows and Mac with iTunes Match from iOS Dev Center only. 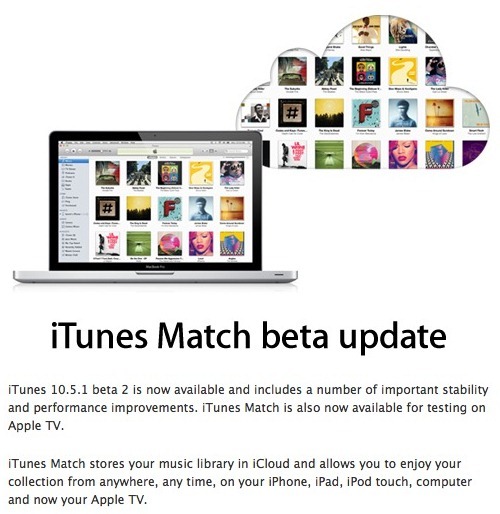 iTunes Match was supposed to be released to public by end of October, which obviously didn’t happen. It is now expected to be available to public in the next few weeks alongside iOS 5.0.1.